California death metal band Exhumed kicked off their performance before Fleshgod Apocalypse even started their last song, diving headfirst into a brutal half hour of growling gruesomeness. They did their best to rile up the crowd, despite their own admitted hangovers, giving little evidence of being in less than fine form. 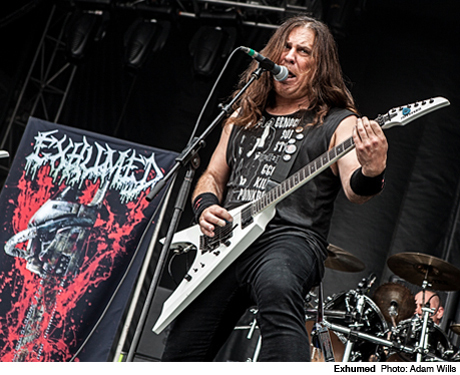 To go along with tracks like "In the Name of Gore," the most eye-catching and visceral moments of Exhumed's set (appropriately) involved some horror-themed theatrics. The band were joined on stage briefly by a chainsaw-wielding butcher, then a few songs later, he returned with a severed head for a climactic "Matter of Splatter," spraying fake blood on the rabid fans grouped nearest the stage.